One of the many Time Warp variants we’ve gotten over the years…though this one doesn’t target, so it’s probably a bit better? Back in the Portal sets, sets designed to be “easier” to play with than your average set, you had some simplified versions of cards that already existed. 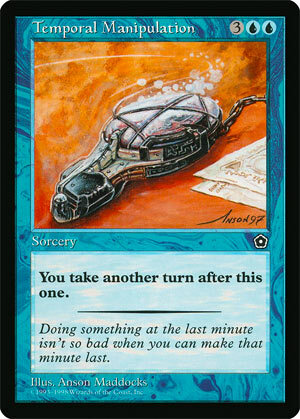 Time Warp, an iconic blue card, was replaced in Portal: The Second Age by Temporal Manipulation and Portal Three Kingdoms by Capture of Jingzhou. The effect is the same, though: spend 5 mana and take an extra turn, which has become the standard mana cost on the blue extra turn spell.